If someone were to ask me what my favorite meal or what my “last” meal request would be, I’d have to say hands down, my mom’s meatloaf with macaroni & cheese, and mashed potatoes. 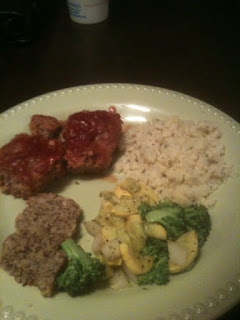 Tonight, I made Paleo meatloaf and it was delicious. I was in heaven, for real. I told Rick, “I don’t think you understand how much I love meatloaf!” I was even super excited that we have left overs for me to enjoy again tomorrow. I’m not sure if there’s any other meatloaf lovers out there, but if you claim to not like it, it’s probably because you haven’t had the right meatloaf. Here’s the Paleo recipe I used in case any of you want to try it. I never measure out my salt or spices, unless I’m baking so use them at liberty. Grease clear baking dish and spread evenly in it. Here’s a bonus for some “sweetness” – drizzle honey over the top.